Welcome back to Kids Get Crafty. 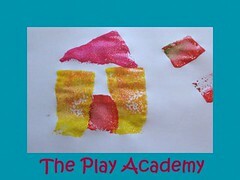 Today we are making Handprint Lions, learning about Renaissance paintings at toddler level and drawing the Mona Lisa! 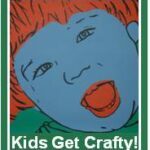 Dont forget Kids Get Crafty is also a link up party/ blog hop for all craftiness with and for children! Do take part. Do be inspired! Link up at bottom of post! Hooray! I like to dedicate this post to a very lovely man called Dave Fowler. Dave is also known by some as Mr Good Guy. By others as Dad. And I am sure by many as friend. I know him via Twitter and you know – he is, well, a Good Guy! A while back he started a charity come art activity called the Mona Lisa Million. He set it up, as he likes, well, helping others. Hop over and find out more! Katie and the Mona Lisa, by James Mayhew. Grandma often takes Katie to the gallery. Katie wonders why the Mona Lisa smiles and whilst her Grandma has a little rest, Katie embarks on an adventure, stepping into and out of paintings. Meeting the Mona Lisa, dragons, lions and angels. We are introduced to 5 of the most famous Renaissance paintings by Da Vinci, Raphael and Botticelli amongst others. It was a lovely way to “view paintings”, providing a little background about the paintings and introducing key artist to both parent and child. I love how it encourages you to “step inside the painting” and imagine what could have been happening. In the end Katie finds out what did make the Mona Lisa smile. Fabulous. I am sure that “the art” element went way above Red Ted’s (2.5yrs) head, however, he really enjoyed looking at paintings and discovering details, whilst enjoying the excitement of the adventure (lots of tumbling and flying and running away). A success. Red Ted was rather taken by Carpaccio’s Lion of St Mark – well, how can you not be taken by a flying lion with rainbow wings?! So we decided to make a lion… . I would have loved to have made the WHOLE lion, but a 2.5yrs old simply hasn’t got the attention span. So we made the head – I got the idea for the head from this wonderful sunflower that Cathy at Nurturestore made a few weeks back. I drew a lion head. Red Ted coloured it yellow and place a very timid eye on it. So I helped him out and made the eyes and nose a little bigger. We then printed his (yellow) hands on brown paper and cut them out. Red Ted sat snipping away next to me, developing his cutting skills whilst Idid all the cutting. Together, we then glued them onto the back of the head (the photo shows the unstuck lion, Red Ted ran off with the finsihed product). If you have more time, wouldn’t it be wonderful to make the rainbow wings out of hands too? 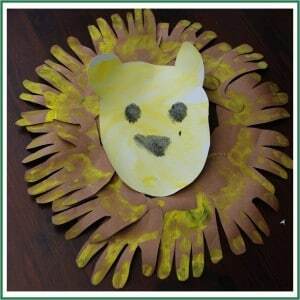 This could be amazing class room project, where each child gets to do a colour and then all the hands together make up the lion’s mane and the rainbow wings? Fabulous. As is this is an ode to The Mona Lisa Million and Dave Fowler helping others, I thought we really MUST draw a Mona Lisa too. So we sat down with some crayons and the book. I picked out the colours for Red Ted and pointed to different parts of the picture. Nope. “Mummy do it”. 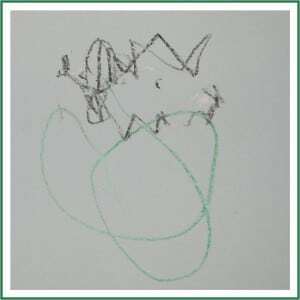 After about 3 of these sessions, he did finally concede and draw me a hasty Mona Lisa (ahem, I had bribed him) – it is in fact the “first person he has every drawn by himself (aged 2.5yrs)”. Nevermind that she has hair on her chin, I think she is WONDERFUL! UPDATE: Dave loved our Mona Lisa so much, that he has launched Mona Lisa by children on his blog… why no help Dave, helping others, and find out more, send in YOUR Mona Lisas. He would be SOOOO chuffed! Katie and the Monalisa sounds like a great book, I am going to get a copy for us! I love the lion by the way, what a fantastic little artist you have there! Maggy that’s really brilliant! Thank you so much. I love it! That looks like such a fabulous book and I know my little lot would love it. I’ll follow your link to Amazon shortly. May I use Red Ted’s Mona Lisa in one of my posts? I will of course give full credit. Oh what a great way to start my day! @Dave So pleased you like it 🙂 And yes of course, go ahead and use Red Ted’s Mona Lisa, when he is older he will be chuffed! @Maria – glad you like the post and the book is indeed lovely! Hope you enjoy it too!! 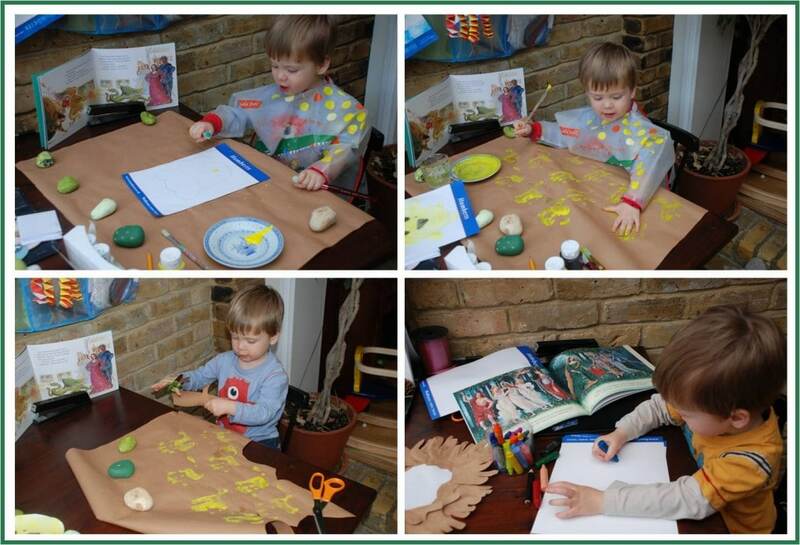 Hi Maggy – so lovely to see how one of our ideas gets picked up and used in a different way . I *love* the lion! 🙂 You sunflower was inspirational!! Ahem, looks like link wasn’t working earlier today! I think it is now…..
Read your article, jumped on to my local library’s web site and reserved Kate and the Mona Lisa for us to collect next week. I’m just busting to see what picture or detail my (very) three-year-old gets excited about. 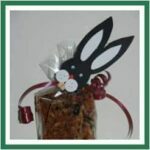 Thanks so much for visiting my blog and commenting! As well as inviting me to link up! Your site is so awesome! I’m so glad to have found it! I’ve been wanting to do art themes with my girls, but wasn’t sure where to start! I’m now following you on FB and will definitely be back!! @Robyn – fabulous! How lucky they have the book on reserve for you! Hope you enjoy it!! @Jennifer – Hooray, so lovely to have you “on board” and get connected! 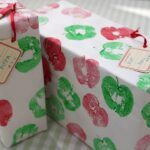 Hope you find things you like on the blog!!! We have “Katie Meets the Impressionists, and I really like it! We’ll have to look for this one, too. 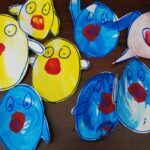 I think it’s a neat way to introduce kids to artists, and a good way to prepare them for a visit to an art museum. 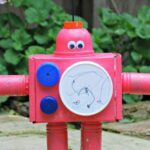 Thanks for visiting my blog, and letting me know about your linky! @maryanne, yes I know want to go and check the other titles out too. 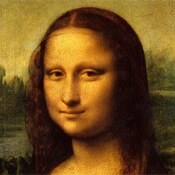 Was very happy with the Katie and the Mona Lisa… lovely way to learn and absorb!!! The lion turned out super cute! Thanks for letting me know about this link-up and for stopping by my blog! I am loving this idea!! soo creative! I’m happy to be your newest follower of your deligtful blog and would love to have you as a friend at Frou Frou decor! I would also like to invite you to link your sweet creations up at my weekly Fabulous Friday Finds party! Hope to see you there! That’s a splendid Mona Lisa! That lion looks adorable. And I agree that its great to introduce the young ones to art. How cute, how cute…how cute!!!! I don’t have any little ones around my house [even my youngest grandson is in high school]………but this was a real pleasure to view. Loved it. The lions are wonderful. I love the colors in his mane. What a fun idea with great results. Thanks for linking up to Beyond the Picket Fence’s Under $100 Linky Party. Thank you for joining WMCIR! We read another book from the same series, but daughter was kind of lukewarm about it, because it starts by Katie climbing into one of the pictures and making a mess. I really like how your Lion turned out. What a great craft! You sure are creative, my friend! Thank you for sharing this with us for Sunday Favorites this week!